Earlier in March 2018 Oli6 (Oli6 Dairy Goat Infant Formula is a premium goat’s milk-based formula) donated 12 tons of formula to New Day Foster Home. We were able to ship this formula out to 23 different orphanages helping to make a difference in many lives. Thank you Oli6 for your very generous donation. Hunger and malnourishment are brutal realities for babies in orphanages too under-resourced to buy infant milk powder, especially for children with complex special needs. Because good nutrition in a baby’s first year is vital to lifelong health, our Formula Project supplies nutritious formula to our partner orphanages for infants until they turn one. We keep a close eye on each child’s monthly progress by tracking growth data on World Health Organization (WHO) growth charts. 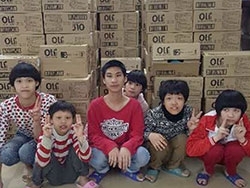 This enables us to identify children who fail to make adequate progress, and we intervene by providing additional nutritional supplements and any needed medical care at local hospitals or our Foster Home in Beijing. The long-term positive impact of our Formula Project depends on education. We provide training for orphanage staff and foster parents in nutrition, basic medical care and child development, giving them the tools to help the children in their care achieve full potential. CLICK HERE if you are interested in helping us with a Formula Sponsorship.